The ceramic shell process is a lost wax process. The original sculpture is made from wax and invested (or covered) in a layer of a ceramic like material. The mold is placed in a burnout kiln and heated quickly to 1500°F. During this process the wax melts out leavig a negative space in the mold the exact shape of the original wax. The mold is then checked for cracks and patched if necessary, and then once more placed in the burnout kiln to be heated up to 1100°F ready for bronze to be poured in. This is my first burnout kiln. 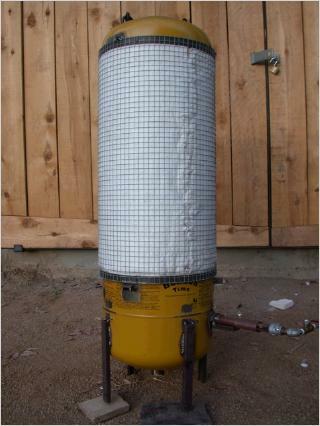 It is made from a helium tank lined with ceramic fiber blanket. It's really only made to hold 1 mold at a time -- I have a larger one for bigger pieces. The burner is a 1/2" venturi that runs on propane. The major problem with this kiln is keeping it from getting too hot! I have to run the burner at about 2 lb pressure. Inside the furnace. The bottom is made of castable and has a hole in the bottom to drain the melted wax. I made a grate (the thing that looks like a wheel) from stainless sheet metal that I dipped in ceramic shell. So far it seems to be holding up well. The bottom of the kiln. 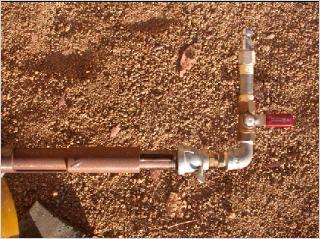 A stainless tube extends into the bottom of the kiln. Melted wax drains out of this tube into a wax pot. 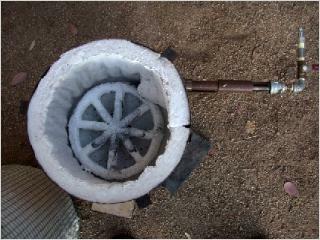 A top view of the burner. 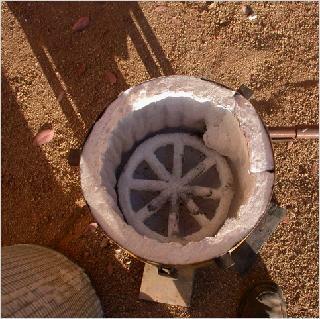 You can see how the burner fits into the kiln. The inside of the kiln is painted with a mixture of colloidal silica and zircon flour. 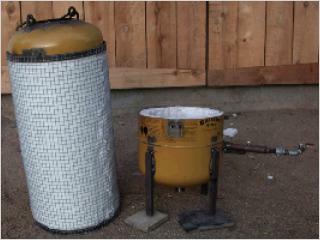 Scraps of moist ceramic fiber blanket were molded around a stainless steel flared burner head. 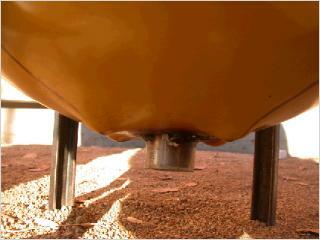 The burner head stays in place, while the burner can be removed for storage. The kiln with the top off.